I have the pleasure of assisting organizations as they transform their sourcing operations from inefficient manual processes to streamlined, automated ones. Change is always hard, and staff are sometimes concerned that some of the steps early in the process are more time consuming; however, I point out that these changes create time savings later in the process. When considering all steps from start to finish, the administrative time for a bid is typically reduced by an impressive 50 to 70 percent! 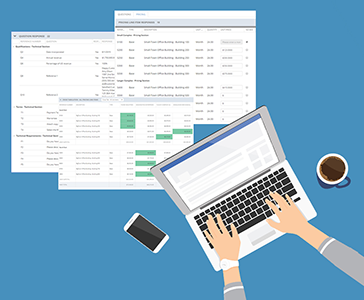 One of the most common questions I hear from procurement staff during implementation is, “how should the supplier bid responses be structured?” They want to know if they should create online forms or simply have suppliers upload bid documents. That typically gets a confused reaction. Before I explain, let me give you a little background on processes and technologies. In manual systems, bid or tender responses are received via hard-copy or electronically via email, portable media, or file upload into an online site like Dropbox. 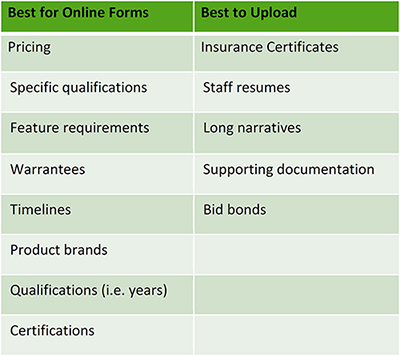 When moving to online, automated processes, bid responses can include both file uploads and online forms. Creating online forms is a new step that can be time consuming, so buyers would prefer to avoid it. However, when they understand the value and downstream time savings of capturing the information in a structured format, they begin to show interest. They start asking more in-depth questions, regarding how to structure the bid response and what information should be captured in online forms versus what should simply be uploaded. This article discusses general principles for deciding how to structure your bid responses. My first piece of advice regarding designing the online bid or tender response is to start with the end in mind. In other words, how will the information be used in the evaluation process and in later steps such as long-term pricing analysis. When you understand how the information will be used, it helps you create a plan for capturing and evaluation responses. The most significant down-stream benefit is times saved during the bid evaluation phase. I advise buyers to put information in a form if they want to use a side-by-side comparison. This works well for questions with simple, short answers but not very well for longer narratives. For longer narratives like a description of an implementation process or a resume, it is better if they simply attach a document with a response. The chart below shows my recommendations for how to collect different types of information in an RFx. 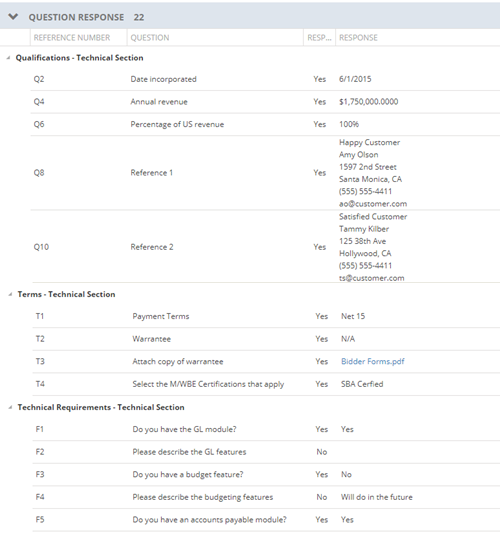 The bid form below shows an example of the technical response for an accounting software project. Straightforward information, like payment terms and annual revenue, are typically aggregates and compared side-by-side. Some information deserves a combination of methods; you might have the supplier enter the number of years covered in a warrantee to make it easy to compare but then attach the warrantee document so that it could be further evaluated to ensure it meets the minimum requirements. These types of supporting documents will probably not be evaluated unless the supplier’s submission reaches a later stage in the evaluation process. Some information, like references and technical requirements, can go either way. The buyer should consider how the information will be used down-stream in the evaluation process. References that will be scored individually in the evaluation process can be captured in a form; however, if the team wishes evaluate “qualifications” as a general category, they should request information uploaded as a document. As you can imagine, we often respond to software solicitations. These responses generally have a spreadsheet that lists dozens or even hundreds of different features and capabilities. Whenever you would normally use a spreadsheet, an online form is better. It will allow you to instantly aggregate the responses for quick and easy comparison. It also eliminates the manual aggregation steps that are time-consuming and error-prone. With few exceptions, it is best to use an online form for pricing. It is not a question of IF there should be an online pricing form, but rather how much detail should be on the form. These forms range from a simple lump sum price, to more detailed forms like the example below. Again, the key consideration is, “how will this information be analyzed?” By creating online bid forms for pricing, buyers can perform evaluations at the touch of a button, do split awards, and look at the bid and award information over longer periods of time. 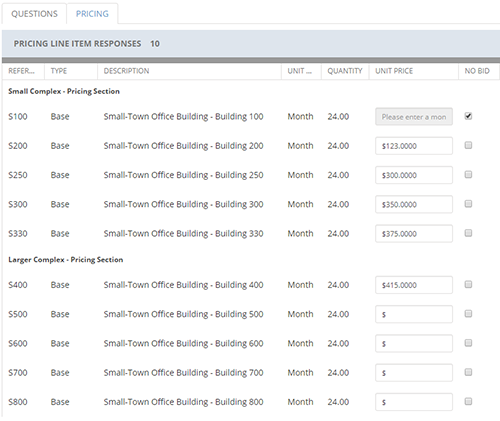 This image shows the automated crosstab evaluation in ProcureWare. Also keep in mind that if you capture different pricing variables, you can evaluate responses using different scenarios and options. Online forms are a power tool. 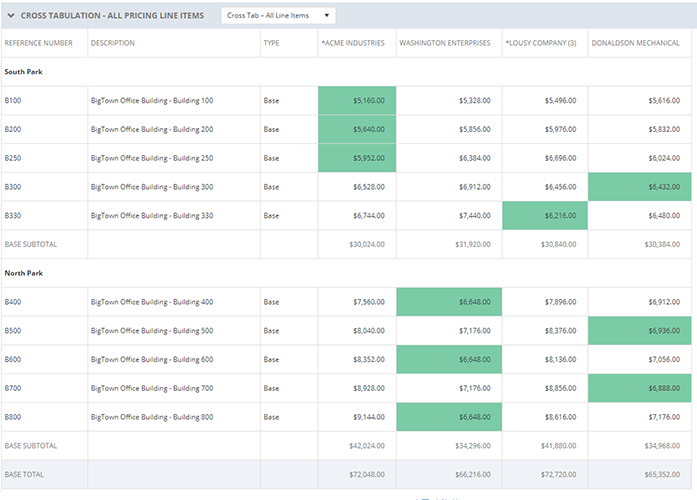 When structured correctly, they save time in the RFx process, allow for more sophisticated evaluations, and can give you greater insight into spend and pricing history. By evaluating the down-stream use of information, you can determine which information is worth capturing in a form and which can be uploaded as a document. This will help you focus your energy on forms that will result in significant time savings for your team.